How Does Doug Baldwin Stay Underrated? You are at:Home»Seattle Seahawks»How Does Doug Baldwin Stay Underrated? Doug Baldwin made it onto NFL Network’s “Top 100 Players of 2018” list again this year. Baldwin was ranked 99th. This is a list voted on by the players so it is surprising Baldwin was given so little love, because Baldwin routinely roasts anyone trying to cover him. So, the question I have is, how does he stay so underrated? Do people write him off for some reason? Is it because of his height or speed? Is it because of his stats? I don’t know. Baldwin has used being underrated as motivation to up his game. Ever since he was undrafted out of college he has played with the cliched chip on his shoulder. I remember when Cris Carter called him a pedestrian receiver and Baldwin threw it back at him after he won a Super Bowl. Baldwin does not forget and he continues to improve. Pro Football Focus just tweeted that since 2015 he has had arguably the best hands in the game. Baldwin has a drop rate of 2.76% on catchable balls, which is almost half a percent better than Larry Fitzgerald who is known for his incredible hands. This past season Baldwin dropped a single catchable pass on 117 targets. Baldwin also scores touchdowns at a high rate. Before 2015 he had never scored more than 5 touchdowns in a season, but since then he’s gone three straight years of at least seven touchdowns. Russell Wilson knows how to get the ball to his favorite receiver, that’s for sure. This connection can make people underrate Baldwin. There are many people who write off the Seahawks’ passing attack because they believe it is bad. Over the last three years Seattle has ranked 20th, 10th and 14th in season passing yards and the 20th place came when the Seahawks had the 4th best offense in the NFL, and Baldwin led the league in receiving touchdowns. So, to say they have been bad at throwing the ball or downgrading the players in the offense is stupid. 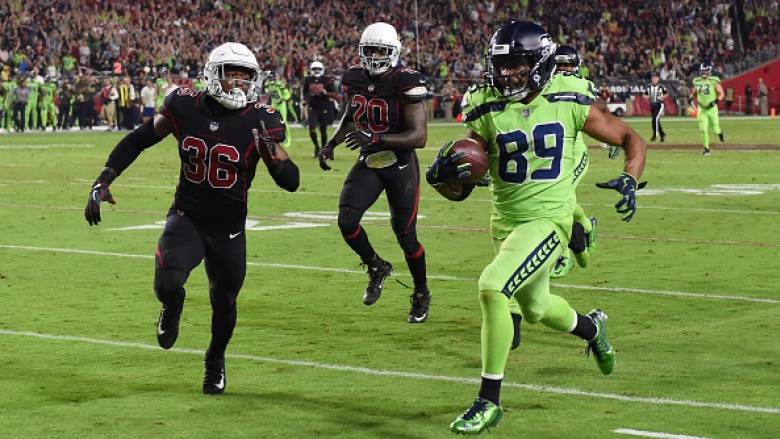 Doug Baldwin also has great feet, his routes are precise and he moves so well after the catch that he is a threat to score whenever he has the ball. This season is going to be filled with a lot of Russ to Doug plays that bring the crowd to their feet. Go to YouTube and check out some of his route running ability, he leaves defenders looking helpless. He has a jab step that he uses that reminds me of an Allen Iverson crossover, just deadly. In conclusion, Baldwin is one of the best receivers in the NFL and he is always too low on people’s lists. That needs to change.